So, having threatened to return to Fire Beacon Hill with intent, that is to find a quarry I had yet to add to my archive, I decide to take the leap and revisit this well endowed reserve. With Buzzards soaring on the early morning thermals rising from the steep sided hills surrounding the site, my ears filled with the song of the warblers and Stonechat, I trudged my way up the hill into the reserve. 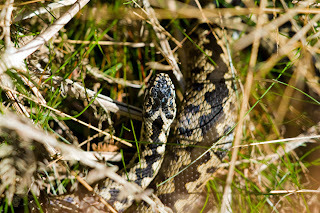 The early stages of my search were less than fruitful, but perseverance paid off, I stumbled near literally upon a stunning looking Grass Snake soaking up some much needed sunshine, unfortunately my change of luck lasted only a few moments before the meeting was called off and she slunk away into the undergrowth. In continuation of my search I started to wade through heather and gorse near enough up to my waist, a technique I'd like to take this opportunity of not recommending, A acupuncturist may cost more but they know where not to cause pain!!! 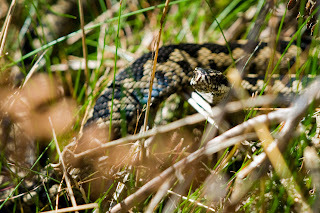 This endeavour however did pay off and I soon found myself looking down upon a perfect male specimen Adder, he decided to allow me a few shots before departing for possibly breakfast or maybe just to be alone again! 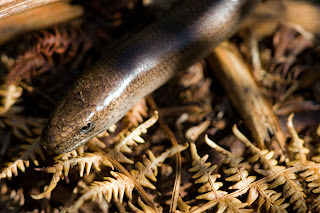 Having completed my task, though I did stop for a Slow Worm shot on my exit, I took to Devon's meandering lanes for a trip to the nearby Seaton Marshes site. 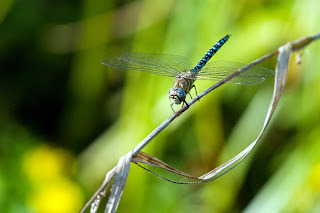 On arrival I was greeted to the sight of a Migrant Hawker flying off to munch on it's newly acquired lunch - a Red admiral. 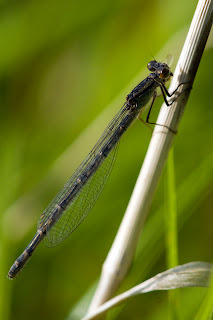 My next face to face encounter was with a Damselfly which shortly after announcing itself to me decided it to wished to dine and in the blink of an eye grabbed a drone fly and devoured it with equal rapidity. 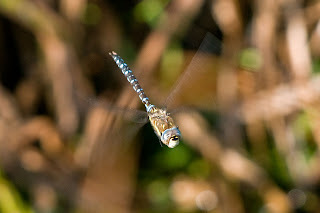 I spent some time following the countless Hawkers hunting along a drainage ditch with the occasional shot being taken. My main source of material however had decided to be a "no show" and so further visits will be made, but that's another story for another day. Great blog, really good pics. I will definetly be following this.